I love a good scare – a scary movie, a haunted house and even an occasional hide-behind-the-door prank. 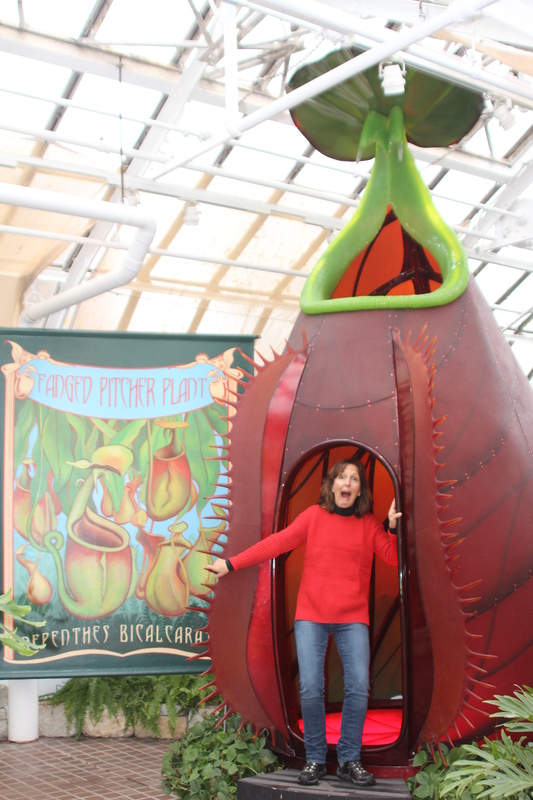 So, I was captivated by the Franklin Park Conservatory’s timely “Scary Plants” exhibit which turned out to be a virtual fun house of horticultural horrors! Two flesh-eating favorites starred in the carnivorous plants display. 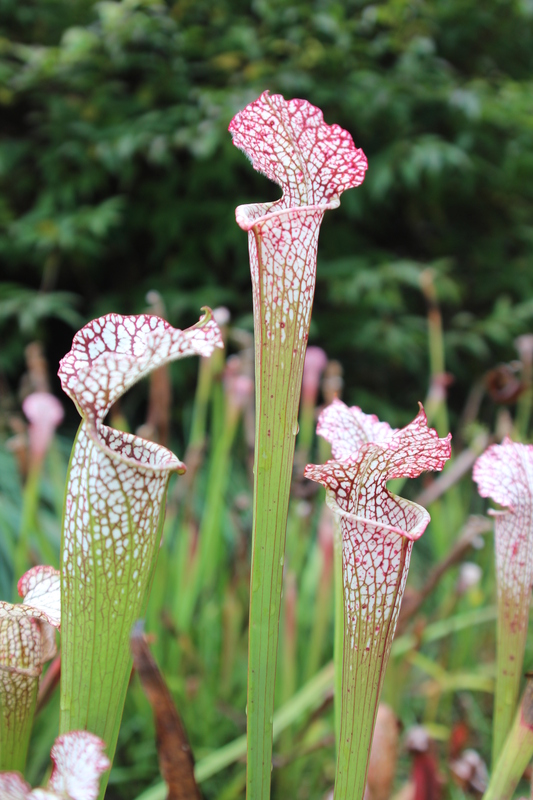 The American pitcher plant (Sarracenia) lures prey inside its trumpet-shaped leaves with an intoxicating nectar. 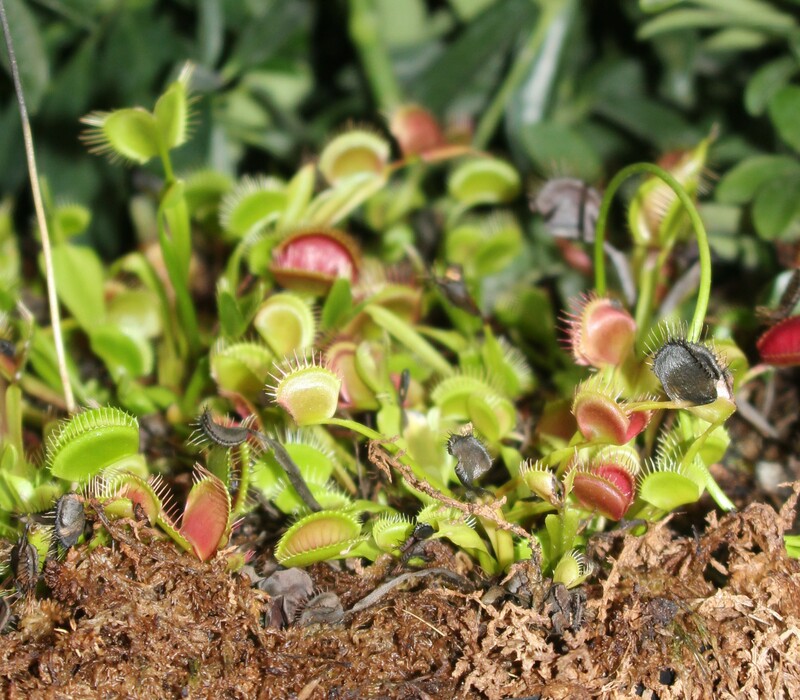 The Venus fly trap (Dionaea muscipula) tricks insects with its open trap that snaps shut when insects unknowingly touch trigger hairs that signal the trap. Equally scary, another group of vicious plants are famed for their spikes and hidden poisons. Don’t be fooled by Daturas’ beautiful blooms – the plants contain highly poisonous tropane alkaloids that can cause hallucinations and even death. Castor bean plants (Ricinus communis) may be fun to grow for their colorful foliage and interesting seed pods, but the plant contains ricin, a deadly toxin. 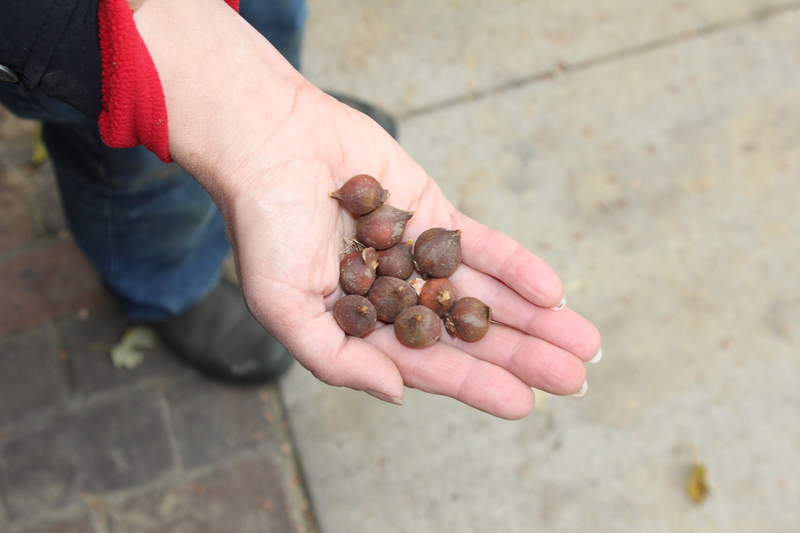 Even the beloved Ohio buckeye (Aesculus glabra) produces nuts that contain poisonous tannic acid. On the prickly side, be sure to sidestep any honey locust trees and their wicked thorns. A neighbor boy was hiking in a nearby preserve with our kids and stumbled upon a thorn which punctured his knee. Ouch! Prickly pear (Opuntia polycantha ‘Bronze’) and porcupine tomato (Solanum pyracanthum) are two other don’t-touch plants. A final group of plants are more bizarre than scary. Check out gray-haired ‘Old Man’ cactus (Cephalocereus senilis) and pumpkin-on-a-stick (Solanum aethiopicum) which is a relative to tomatoes and eggplants. 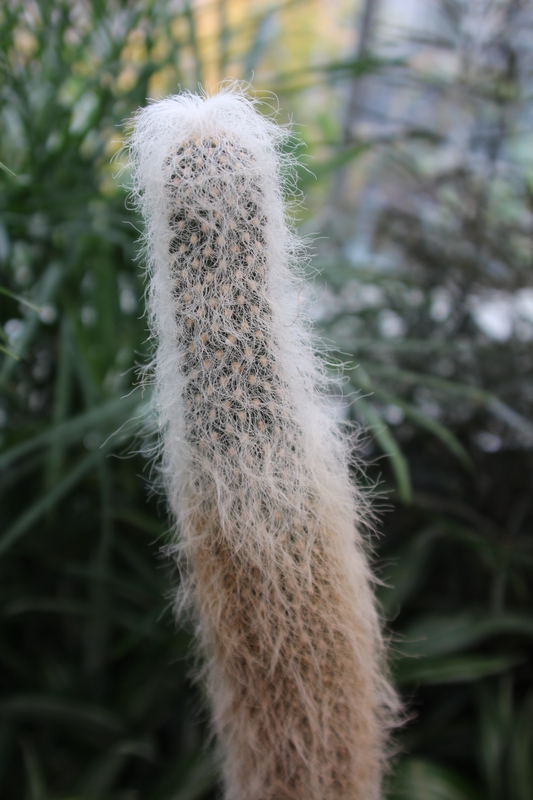 If I haven’t scared you away, visit Franklin Park Conservatory to learn more about these botanical wonders. 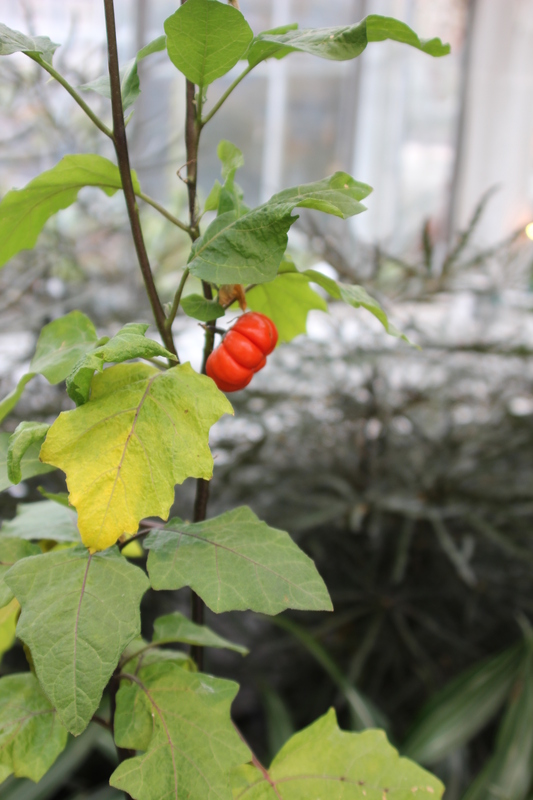 The ‘Scary Plants’ exhibit runs through Nov. 9. Other ghoulish garden events include the Haunted Conservatory (Oct. 30) at Garfield Park Conservatory in Indianapolis, the Creepy Crawl (Oct. 31)at Missouri Botanical Gardens in St. Louis, and the Jack-O-Lantern Spectacular (through Nov. 9) at Iroquois Park in Louisville. Imagine an alpine meadow of dainty tulips in Kazakhstan or stout red tulips thriving on the rocky slopes of the Elburz Mountains in Iran. After seeing this collection of images from Tulips in the Wild, I decided to give these tough little beauties a try. Last fall, I planted clusters of 8 to 10 Tulipa linifolia and Tulipa clusiana ‘Tubergen’s Gem’ along edges of our meadow. In April, they made a charming show with natural, wildflower-like blooms – much more fitting for the meadow setting than their larger, more showy hybridized cousins. If you want to try planting some of these ‘wild’ or species tulip bulbs this fall, here are a few suggestions. Plan to order a larger quantity than expected, since the bulbs are smaller and look more impressive when planted in mass. Also, consider a location where these diminutive spring flowers will get noticed like a walkway, a mailbox garden or a border’s edge. The bulbs will grow best in a sunny location with good drainage, ideally a sloped area that is not irrigated. While deer are known to eat tulips just as they open, I was fortunate they didn’t find these blooms. However, be prepared to protect them with barrier plants or a deer repellent. For bulb sources, check out Colorblends – 888-847-8637; Brett and Becky’s Bulbs — 877-661-2852; Van Engelen — 860-567-8734; and Bluestone Perennials — 800-852-5243. Debra Knapke will be talking about “Biophilia: Understanding Why We Garden ” as the morning keynote speaker at this weekend’s Ohio Master Gardener State Conference at Ohio Wesleyan University in Delaware, Ohio. Why do we garden? Ask doctors, and they’ll point to the health benefits. Ask some authors, and they’ll pull out their books on gardening’s spiritual, meditative and stress-relieving benefits. Flip through gardening magazines, and these beautiful outdoor spaces are undeniably a powerful source of creativity and entertainment. Debra was intrigued by the question and has been investigating this biophilia or “affinity with nature and love of living things” as first defined by E.O. Wilson in 1984. She’ll share her findings and how they relate to our work as gardening educators. Teresa will be working behind the scenes at the event as a member of the conference planning committee.